These were on and off the needles in the space of a month. I like them a lot, and I like you guys a lot too, to be prepared to put socks on for photos today when we’re in the grip of a mini-heatwave. 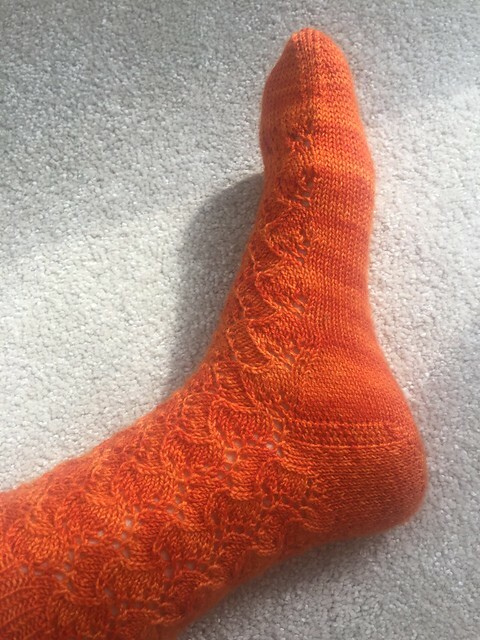 The basic structure of the sock is from the Hermione’s Everyday Socks pattern, which I followed faithfully except for switching out the stitch pattern for the leg/foot with a slightly weird twisty turny lace one instead (it’s at the bottom of this post, if you are interested in trying the same). 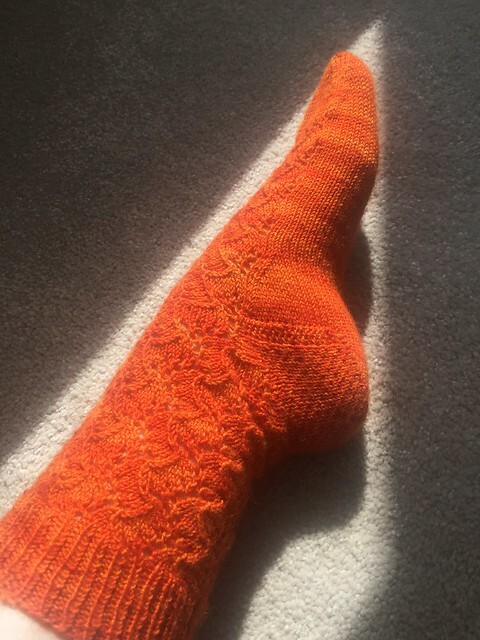 I did five repeats of the lace pattern in the leg, and 4.5 repeats on the foot. I really like the garter eye-of-partridge heel. The stitches picked up along the edge of the garter strips grow seamlessly out of them – very satisfying. I will use again. Ahh but it is too hot to craft a clever long blog post, though. Have some more photos and feel free to insert your own witty commentary as appropriate. Oh, and you can read an explanation for the name of these socks here. 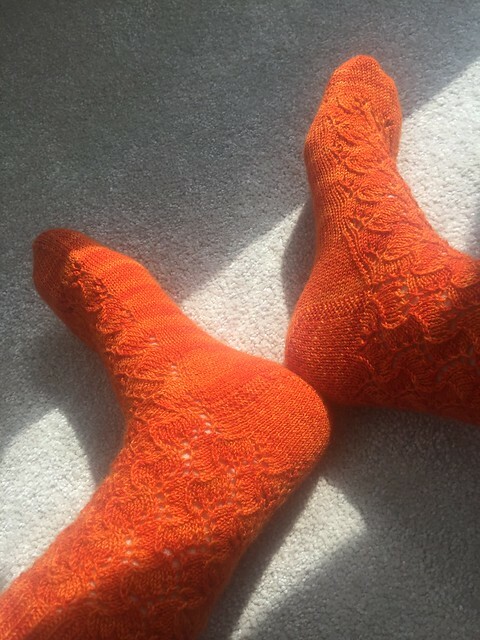 Fyre lace – Knitted in a multiple of 8 sts/12 rounds. Round 1: * yo, k1-tbl, yo, ssk, k5; repeat from * to end of round. Round 2: * k3, k2tog tbl, k4; repeat from *to end of round. Round 3: * yo, k1-tbl, yo, k2, ssk, k3; repeat from *to end of round. Round 4: * k5, k2tog tbl, k2; repeat from *to end of round. Round 5: * k1-tbl, yo, k4, ssk, k1, yo; repeat from *to end of round. Round 6: * k6, k2tog tbl, k1; repeat from *to end of round. Round 7: * k5, k2tog, yo, k1-tbl, yo; repeat from *to end of round. Round 8: * k4, k2tog, k3; repeat from *to end of round. Round 9: * k3, k2tog, k2, yo, k1-tbl, yo; repeat from *to end of round. Round 10: * k2, k2tog, k5; repeat from *to end of round. Round 11: * yo, k1, k2tog, k4, yo, k1-tbl; repeat from *to end of round. Round 12: * k1, k2tog, k6; repeat from *to end of round. Repeat rounds 1 to 12 as many times as necessary. These are so awesome! They’re like rippling and moving fire one would see in the palace of a kingdom. Beautiful pattern and colour, that fiery lace is brilliant. Pretty! Like the bold color. 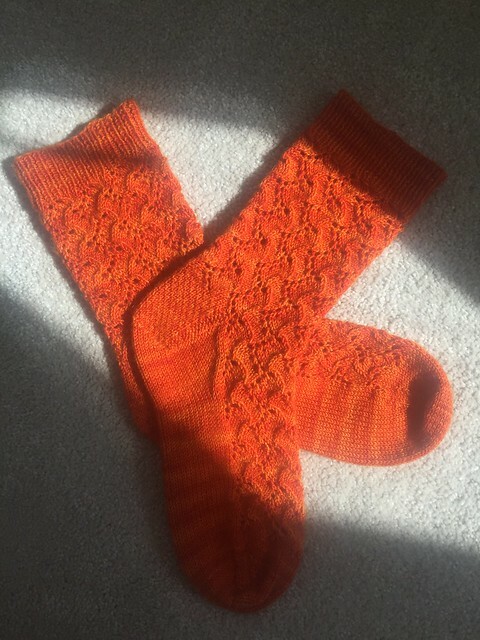 Thanks very much 🙂 I love the orange too – it’s one of the best things about socks, you have licence to go wild with colour! So true. I am currently knitting socks for my son. I picked up this yarn with rich colors called Kente Cloth. They will make quite the statement! I seriously adore the orange. I need to pull out a skein of orange from my stash and start knitting with it. They turned out so awesome. Thank you too for posting how you knit the lace section. It’s really cool! You’re welcome – would love it if someone else tried it one day. 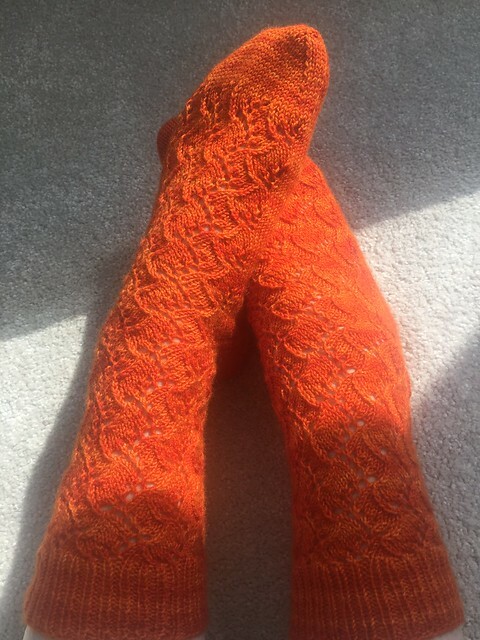 And I’m definitely a convert to knitting in a ridiculous splash of bright orange!